This is adorable- she did a fabulous job!! That's such a bummer that you're having those issues with your cricut! I don't have one so I don't have any experience with it. Hope you get it working better soon! Awww this is so darling....how sweet and pretty, I love it!!!!! Oh my! That is adorable! That doodle is artist quality! I am impressed! The card is just perfect. Sammy did an awesome job! I think your friend must be very special to leave up all the Christmas things to spend a second holiday with you and the children. What a nice thing to look forward to after the hustle and bustle of Christmas is over. Tell her she did a super duper job! Your daughter did a fantastic job on the card - it is so cute! Love your "new" blog. The kitty is so adorable. Aw! Gail that is so cute!! I have to use my HK cartridge soon! I got mine shortly after you said you finally got yours. Great card even if the eyes didn't cut correctly. Wow! This is a really cute card! Your dd did a great job! This is so cute. Makes me want a cricut and more HK stuff. 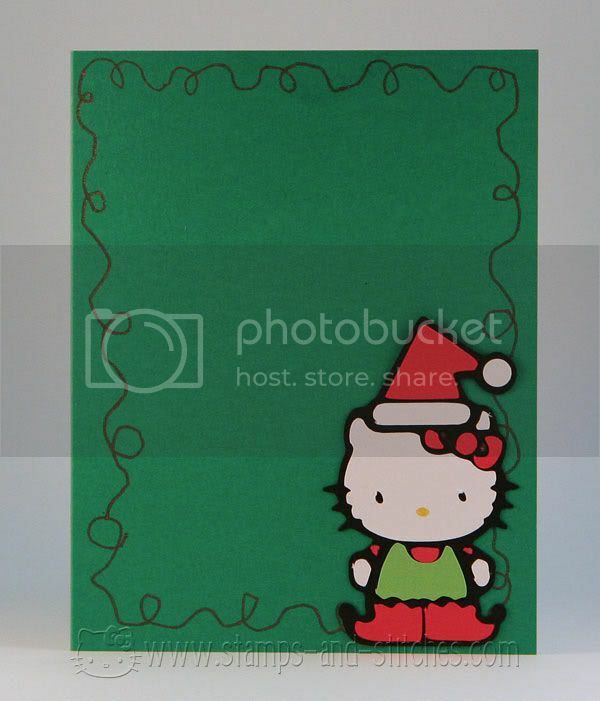 This is really cute, what a fantastic job on the little pieces of Hello Kitty. What a fab friend to have and what a lovely family tradition. How creative your daughter is. This is adorable. What a cute card! Your DD must be proud. I love crafting with my kids too!